This HUGE AP/setting-supplement clocks in at a massive 437 pages, 1 page front cover, 1 page editorial, 3 pages of ToC, 3 pages of SRD, 1 page back cover, leaving us with pretty ridiculous 428 pages of content, so let’s take a look! All right, we begin this huge book by basically taking a glimpse at the region of the Sundered Kingdoms – wait, that’s not the right way to describe it: The war-and calamity-torn Sunderlands receive a massive, stunningly detailed and well-written gazetteer that clocks in at 32 pages – from discussions on the local technology-level to area by area breakdowns of settlements and the like, we get a tremendous amount of detail here, including write ups for INNS as well as caravansarais…and it should be noted that this does not include the colossal 12-page, detailed history on this region in its afore-mentioned page-count. The level of captivating prose exhibited in these pages hearkens back to a time where immersion by means of detailed lore were more important: When e.g. the fully depicted, brief fable of a cat seeking a wife not only is mentioned, but in fact reproduced, that does enhance the believability of the area a great deal…and yes, settlements do get proper settlement statblocks. But beyond these, the book is one about the eponymous cults – which not only provide stats for athames as well as some new domains for the respective cultist patrons – from classic Orcus and Tsathogga to Hastur, the entities of chaos and destruction and their dread obelisks of chaos that litter the landscape as dark monuments, as foci for the dread cults of darkness, come in a surprisingly detailed write-up that depicts a world teeter-tottering unknowingly on the very edge of annihilation by the forces of chaos, with twisted, evil versions of the Diplomacy-concept as a domain and the like adding a bit of crunch to the fray, though yet another shadow domain, for example, imho wasn’t necessary. The third chapter, then, would be the bestiary section and comes supplemented with both new hazards and common…and less common adversaries, including two spawns of demon lords and bone dragons, Similarly, the magic item chapter (including a cursed cowbell!) sports artifacts and wondrous objects galore, with aforementioned obelisk-powered items of chaos and unique items featuring prominently, already hinting at the things to come. But you want o know about the adventures, right? All righty, so before we dive in, you should know that the previously released modules herein have been integrated into basically a cohesive storyline, a kind of meta-narrative not unlike those featured in Paizo-APs, making this not a collection of different adventures (though they can be played as such), but more of an arc connected by theme, if not by the necessity of sequential playing… Basically, you can play these modules as stand-alones or as connected pieces – they do not lose appeal by being separated from the overarcing structure. Know, dear reader, that from this point forward, the SPOILERS abound! Potential players should jump to the conclusion. We begin this tome’s adventure section with Greg A. Vaughan’s “Beasts Among Us”, intended for 3rd level characters – uncomplicated, but savage, this module confronts the PCs with a massacred caravan and a trail leading towards a dread cult of bandits in the wilderness, happily butchering survivors – by stopping these brigands, the PCs can rescue one Kandrel, who was en route to the city of Endhome (of Lost City of Barakus)-fame and acts as a potential liaison for the powerful shipping magnate Lord Beval…provided the PCs can save him from the brutal fangs of the werewolf master of the brigands. The second adventure, potentially to gather further influence, would be Patrick Lawinger’s classic “Morrick Mansion” (level 3 – 5), which to this day remains one of my favorite 3.X modules released by Necromancer Games back in the day. Why? Because the module twists the traditional haunted mansion trope, detailed grounds and all, by making the primary antagonist of the module not simply a creature to be defeated – instead, as a kind of precursor to how haunts work nowadays, the adventure focuses on actually finding out how the calamities befell Morrick Mansion and breaking the mutation and insanity-causing chaotic curse that twists and changes the mansion grounds. From Grollek’s Grove to finding out the truth behind the curse, the adventure is in probably its best iteration in this book. Kudos for saving this glorious classic for a new generation of gamers. …and that would be the legendary classic “Aberrations” (level 6 – 9) by Casey W. Christofferson. It ranks, by far, as one of the most underappreciated modules Necromancer Games released back in the day – a disturbing yarn of horror and weird, dark fantasy, this module has it all: Deformed giants, savage caverns, legacies of insanity and murder, a brutal meat-grinder of a mansion and the chance to duke it out with the spawn of a demon lord – this adventure has it all and, frankly, I can’t really do it enough justice: If you enjoy DCC-style dark fantasy and challenging modules, this one will do the trick. Seriously, this is a true classic that only gains impact by its ties to the unobtrusive metaplot of this saga. And then, there would be “The Crystal Skull” by Dave Brohman- one of the most obscure and rare Necromancer Games modules (which I gladly own), this is a massive mini-campaign in itself, ranging levels from 9th – 12th…though the challenges posed in this one are SIGNIFICANT. Smart PCs may have followed multiple clues throughout this saga, pointing them towards the massive city of Penmorgh and invited to the home of one wizard named Pearsey, who beseeches the PCs to undergo a complex series of investigations into the dark things going on within the city – every year at Midsummer, 3 girls go missing, their bodies to later be found horribly mutilated….he wants the PCs to stop whatever horrific ritual is going on…and the PCs, following the trail, will have put themselves in the crosshair of deadly assassins and unearth the secrets behind two eminent guilds of the city…thereby, probably, inadvertently freeing dread Mhaazoul, 666th son of Orcus and nascent demon lord – to stop the dread entity, the PCs will have to track it overland through different settlements, survive the machinations of the lethal minions of the demon… to the Tower of Bone. Which is impenetrable for them…to enter the tower and stop dread Mhaazoul, the PCs will have to pass the ruined, subterranean dwarven city of Durandel, successfully navigate its claustrophobic confines and finally infiltrate and beat the dread tower and its master. Oh, and if that is not enough: The previously unreleased secret levels-bonus dungeon for this one is also included in the deal. A total of 11 pages of handouts and 40 pages of maps are provided in this book as well – though, if you’re like me and expected player-friendly maps sans legends or the like, I’ll have to disappoint you – this time around, the book features none of these. Editing and formatting are top-notch, in particular for a book of this massive size. Layout adheres to Frog God Games’ two-column b/w-standard and the pdf comes with detailed, nested bookmarks. The physical book, as with all FGG-books,. is a superb, stitch-bound hardcover made to last. Interior artwork is generally high-quality, though a precious few pieces taken from crystal skull didn’t blow me away then and still don’t. Cartography is a bit less consistent than usual – while some maps are drop-dead gorgeous or at least functional, there are also some maps re-used from a time when the 3.X bubble had burst and funds were tight -and it shows. Compared to the other maps, these look a bit less impressive and I really wish they had been redone. Similarly, I would have wished for player-friendly maps. Frog God Games, at this point, is an institution – when they announced this book, I was honestly puzzled who they’d tie the respective modules I already knew together in a meaningful way…and they did. While the metaplot isn’t too pronounced when compared to singular mega-adventures, the themes and leitmotifs can be found throughout, lending a sense of cohesion to the whole. Indeed, the respective adventures (with the first, as a setting of the stage and thus, being relatively simple) feel surprisingly in line regarding their themes and content – a feat, considering their patchwork origins. At the same time, though, there is a bit of thematic whiplash regarding the finale – while I really like “The Crystal Skull”, it is also the most traditional of the modules herein – where the adventures before focused on a delightfully old-school dark fantasy with ample of weirdness, the final mini-campaign feels grim, yes. Dark, yes. But also more traditional in its structure, plot and locales presented. Personally, the middle trinity of Morrick Mansion, Shades of Yellow and the superb Aberrations, represents the sweet-spot of this saga and, chalk it up to my excessive collection of NG-material, but personally, I probably would have used the likewise classic and pretty obscure “Vindication” rather than “Crystal Skull” as a culmination of this arc…but yeah. I’m complaining at a very high level here. And I can see why CS was chosen – it has the fitting leitmotifs and is a very good, diverse adventure that features socializing, investigation and plenty of chances to swing one’s sword at evil. The matter of the fact is that this massive book contains a load of brilliant adventures, with some true classics. The build-upgrades for the NPCs are more versatile and utilize some builds that go beyond the standard. The organization is excellent and the only true complaint I can truly voice pertains to the lack of player-friendly maps and parts of the cartography. How to rate this, then? 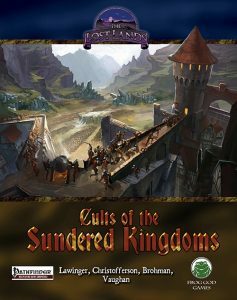 Well, since this has ample of tie-ins with Endhome and Bard’s Gate, GMs wishing to run either can and should definitely take a look; similarly, fans of the Lost lands will consider this a must-have purchase anyways. If you already own the three previously released modules and have played them, things get a bit more complicated – while the two new full-length modules are superb (excluding the intro-module here), only you can decide whether they may the tome as a whole worth it for you. If, however, you haven’t played the classic modules, then this turns into an almost immediate no-brainer, for the history and context provided in this tome render the iterations of the modules superior to their classic 3.X versions. In the end, I will rate this 5 stars + seal of approval as an official rating for those among us who haven’t played the classics. For guys like yours truly, this still is a very good book, though perhaps one that should be closer to 4.5 stars. In the end, my official verdict will obviously be the former – this is, in a nut-shell, a collection of great material for those among us who like our fantasy dark without diving off into the grimdark spectrum. You can get this massive tome here on OBS and here on tabletoplibrary.com! Do you prefer the old-school S&W-version? You can get that one here on OBS and here on tabletoplibrary.com! Finally: The current kickstarter of Frog God Games, for the linchpin city-supplement Bard’s Gate (in PFRPG, S&W and 5e! ), for practically THE metropolis of The Lost Lands, is within its final hours – take a look at this beauty here!